As today is St Cecilia’s Day – the patron saint of music – what better time to remind you of some forthcoming musical events happening on campus over the festive season. The Sir Robert Martin Theatre in Martin Hall will be hosting the Midwinter Cheese Madness on Saturday evening 1st December (6.30-10.30PM), a live musical event featuring bands local and national, co-organised by staff and students of the English Department, with all proceeds going to Cancer Research UK. For tickets and further information email cheese@lboro.ac.uk or visit https://www.facebook.com/MidwinterCheeseMadness . On Wednesday 5th December the University Choir will be staging its annual Christmas concert, featuring the music of Berlioz, Britten and Joubert among the usual seasonal favorites, and featuring a performance by the University String Orchestra. Just after the New Year, on Friday 18th January, the University’s Martin Hall will be visited by the Maggini Quartet, one of the UK’s leading string quartets, internationally acclaimed for their concert performances, appearing frequently at home and abroad, along with regular media broadcasts. 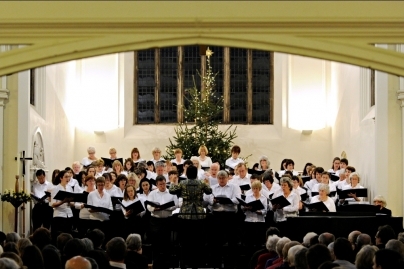 They will be performing a selection of Mozart, Britten and Schubert. Full details of both events can be found via the University’s Arts site here. Don’t forget we’ve got a wide range of books and journals on the subject of music among our collection on Level 2, covering the complete spectrum of musical genres from classical to jazz to hip-hop. You may also be interested in browsing Rock’s Backpages, an archive of music journalism going back to the 1950’s, or the British Library’s Sounds database, a two-year development project encompassing 3,900 hours of digitised audio freely available to the Higher and Further Education communities of the UK. This entry was posted in Arts at Loughborough, Culture, Databases, Electronic resources, Music, Performing Arts, Print resources, Resources, University Events by Steven Lake. Bookmark the permalink.